Stewart Walker attends a prayer vigil Tuesday for students killed and injured after a 15-year-old boy opened fire with a handgun at Marshall County High School. Bailey Holt and Preston Cope were killed in their high school this week. They were both 15 years old. But has the news of students being killed in their school lost the power to shock and sober us? At least 16 other students, all between 14 and 18, at Marshall County High School in Kentucky were injured when another student, age 15, opened fire in their school on Tuesday. That’s how parents feel about their children in their souls. To report that two students were killed in their school was once the kind of story that would dominate the news of a week. And to be sure, the deplorable deaths and bright lives of those two youngsters have received intense attention. But the killings in Kentucky were the 11th school shooting of the year, and the first month of the year is not over. There have been almost 300 school shootings in the United States since 2013, according to the gun control advocacy group Everytown for Gun Safety. While we may remember some of the names of places where students died — Santa Monica, Calif.; Roseburg, Ore.; Rancho Tehama Reserve, Calif. — and many of the names of the victims, those harrowing statistics suggest school shootings now occur at the rate of almost one per week. If another school shooting takes place next week, we may be shocked and saddened all over again. But not surprised. School shootings have become commonplace. 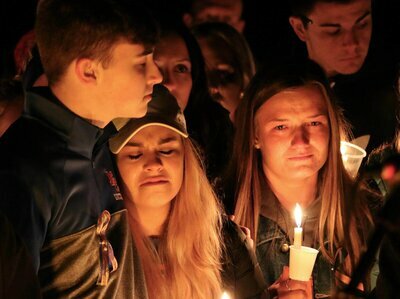 News organizations now know whom to call for reflections on how families and towns can try to contend with loss and grief, and on counsel and care for sad and traumatized students. And of course, we know who to call to hear from those who dispute even the most modest regulation on guns. We have had to make those calls time and time again. People attend a vigil on Thursday for the victims of a fatal shooting at Marshall County High School in Benton, Ky. Many U.S. schools now have routine drills on how to take shelter if a gunman bursts into their school. Parents may worry if those drills do more to prepare or panic their children. But it’s hard to say training to hide from a shooter doesn’t make as much sense as fire drills, when the tragic and outrageous fact is that more youngsters are injured or killed in school shootings each year than in school fires. The fear of children dying in their classrooms has become an everyday fact of our lives. But have we stopped being shocked? In the audio, as in a previous Web version, we incorrectly say that at least 16 people were shot in addition to the two fatalities. Not all of those who were injured were shot.